A thankful heart opens the door to a vibrant relationship with Jesus. Jesus Calling: 50 Devotions for a Thankful Heart brings the warmth and insight that more than 25 million people have enjoyed through Jesus Calling in devotions curated specifically to help you see the blessings God has poured out on your life and help you develop a heart of gratitude. 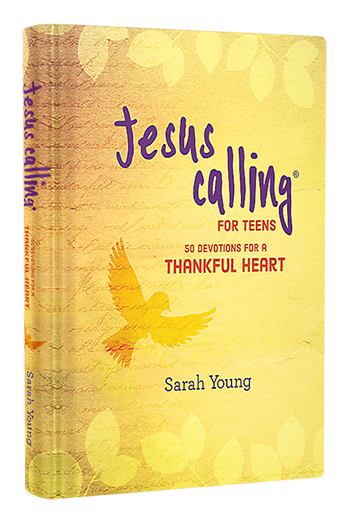 Jesus Calling: 50 Devotions for a Thankful Heart features 50 readings from Jesus Calling gathered together in a new way and combined with relevant Scripture verses on the topic of thankfulness. Readers around the world already love how Sarah’s words connect with Jesus. Now the new Jesus Calling topical devotionals offer a way to focus even more deeply on the major felt needs in your life . . . and the lives of your friends, family, church, school, and friends. With a beautiful, classic cover and affordable price point, these topical devotionals are a natural addition to the Sarah Young brand—and the perfect way to pour into those you love.